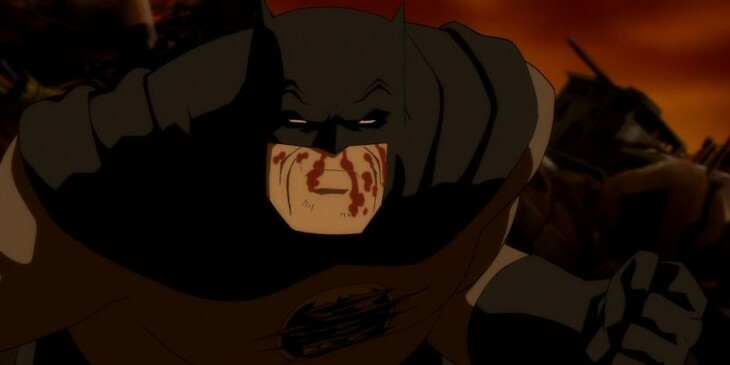 If you thought The Dark Knight Rises featured an old and broken down Batman, wait till you see The Dark Knight Returns: Part 1. From the very first scene, Batman (voiced to perfection by Peter Weller) is near unrecognizable. Now donning withered, gray hair, Bruce Wayne is retired and trying to keep a low profile. It has been ten years since Batman last made an appearance, and now Gotham is rampant with crime and debauchery once again. The return of the maniacal Two Face — now with a completely reconstructed face — convinces Bruce to bring out the black cape and try to save Gotham. In this disappointing drama, Olivia Thirlby stars as Martine, a young artist who stays with a Silver Lake family in hopes of finishing her filmmaking project. Thirtysomething Peter (John Krasinski), a sound engineer and the father of the household, is helping her with the mixing, and he is instantly attracted to the young, carefree guest. The film quickly turns into a “will they or won’t they” drama, and this extends into the rest of the family. Peter’s wife, Julie (Rosemarie DeWitt), is a therapist who is tempted by one of her clients (Justin Kirk). Their 16-year-old daughter, Kolt (India Ennenga), is infatuated with Peter’s assistant, David (Rhys Wakefield), and he is more interested in the age-appropriate Martine. Oh, and there’s Marcello (Emanuele Secci), Kolt’s sleazy Italian language tutor who keeps hitting on her. Alcoholism is a tricky subject to portray in film, but Smashed offers an interesting perspective — what if an alcoholic attempts to get help, yet their significant other makes no effort to cease their own drinking? This is the case with Marie (Mary Elizabeth Winstead), a school teacher who hits rock bottom and realizes she needs to get help, fast. It turns out that her colleague, Dave (Nick Offerman), has been sober for ten years, and he brings her to an Alcoholics Anonymous meeting. She finds a sponsor, Jenny (Octavia Spencer), and begins the road to recovery. However, this begins taking its toll on her marriage, as her husband, Charlie (Aaron Paul), has little interest in stopping his heavy-drinking ways. Have you guys seen any of these? What did you think of them? Awesome, can’t wait to check it out! I’m loving these Batman animated movies. I picked up ‘The Dark Knight Returns’ on DVD. Parts 1 and 2 and both are excellent adaptations on Miller’s work! With the edges softened and smoothed, yet highlighted by superior animation. I loved the flashes of smoke shrouded fist and gunfights in part 1. And their fully fleshed out versions and fight with Superman in part 2, A very ballsy move by Warner Brothers, overall! Peter Weller has found a new niche as the voice of an older, angrier and wiser Batman! Hi Jack! Ah yes, I heard Superman makes an appearance in part two. Really looking forward to that! Can’t wait to see what happens with the Joker as well — that was a nice little setup at the end of part one. Loved Peter Weller as Batman, too, as he fit in so seamlessly. Really strong voice acting all around, actually. I was curious to see what you thought of Nobody Walks, Eric. Glad you’re in my corner. I hated it, it was my worst movie pick of 2012. “None of the characters are given any real development, and none of them, save maybe Julie, are even remotely likable.” Exactly, if it weren’t for Rosemarie DeWitt’s character, I would’ve hated it even more. Yep, I remember your festival review of it. Figured I would give it a shot anyway since it is on Netflix Instant, but wow, what a waste of that cast. It’s easily one of the worst 2012 films I have seen so far, too. Man, I am right there with you on Nobody Walks. Thirlby, DeWitt, Dunham – I love a lot of the talent involved, so I expecting it’d be good. But damn… what the hell was that? A chore indeed. No clue how it turned out so poorly, man. I even went into it with lowered expectations, but wow, this was just awful.